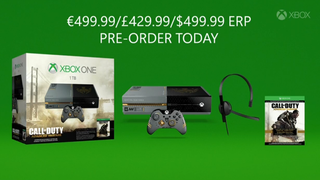 Today at Gamescom, Microsoft announced that they're launching a Call of Duty: Advanced Warfare Xbox One bundle on November 4. Notably, the included console comes with a 1TB internal hard drive—double the size of the standard console's HDD. The bundle costs $499.99, and includes an Advanced Warfare-branded console with a 1TB hard drive, a custom controller, a headset, and a digital copy of the game.